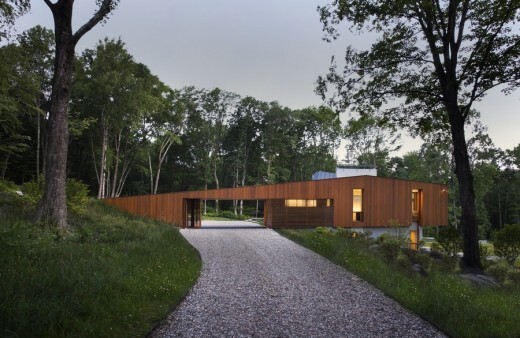 The Bridge House is located in Kent, Connecticut, along a 300′ ridge that parallels the Housatonic River and Kent Falls State Park. The Kent Falls are a series of cascades formed when the bedrock contains alternating hard and soft layers that erode over time. The most striking experience of this dynamic geological and ecological system is the gradual and cascading flow of rock and water as they ebb and flow over time and slowly slide down through the more stable and rooted surroundings of trees, plants, and earth. Our impression of the falls and the more recent “historic covered-wood bridges” of the area inspired the conceptual design of the Bridge House. Translating and mirroring the slow geological flow of bedrock and the more active flows and streams of water above, we invented a strategy where the building becomes a bridge, springing out of the sloping topography. 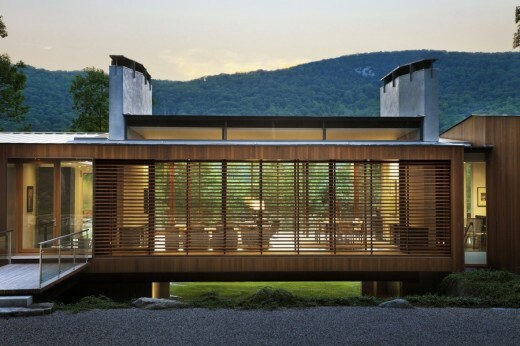 As the house takes on form and volume it turns and spans across the landscape, which rolls directly under it and down the hillside. This “living/dining bridge” is anchored into the hillside by two opposing concrete foundation/buttress/chimney structures with dual hearths. 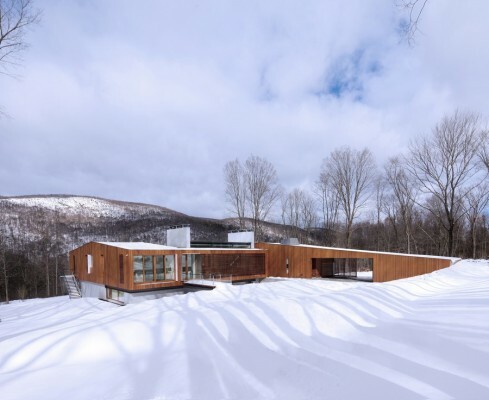 The house form and its key interlocking interior space, the dual living/dining area, are now open on both sides and turned parallel to the open meadow, the valley floor, and the Housatonic River below. 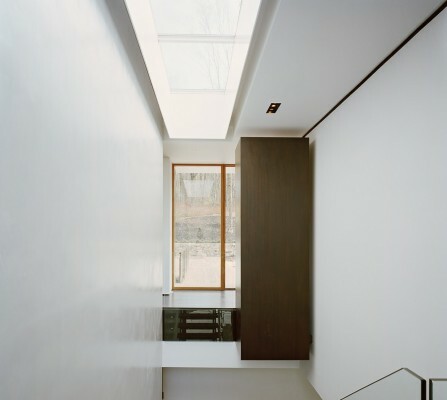 The living/dining area and the vertical stair-light wells are a wonderful example of a “camera lucida” or viewing chamber, projecting external conditions (site views, changing weather, light, and air) on internal relations (activities, rituals) and vice versa. These chambers create a life-world suspended between land and air. This feeling of suspension produces just enough of a “loose fit” and play between nature and convention for the unexpected to emerge. The house oscillates between a tree house, a campground, and a cave all in one, providing a perfect vacation escape. General Contractor: Corporate Construction, Inc.